We’ve alluded to the Macallan’s recently released 1824 Series a few times in recent blog posts, but we’ve not really had a chance to sit down and properly dig in to what the range offers. With the top of the range, the M, now hitting general retail in the UK and the Macallan Gold coming up on a year since release, it seemed like a good time to do a bit of reflection and examination. 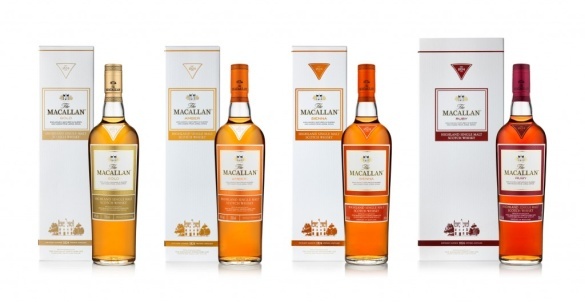 To recap: last year Macallan made the controversial move of releasing a range of no-age-statement whiskies to replace a number of their popular drams. The Fine Oak range disappeared almost in its entirety and whiskies under 18 years of age are now down to the last few bottles in most markets around the world. The new range was to be fully sherry matured, harking back to the famed Macallans of years past, and would be named, and here’s where the funny looks started, based on their colour. The new expressions, from least to most expensive would be called Gold, Amber, Sienna and Ruby. Macallan weren’t talking about dosing their whiskies with caramel to push them up into the correct Pantone bracket, instead focusing on vatting together casks of whisky to produce both the flavour profile and natural colour they required in each of the new releases. A bit of an ask, hence the use of caramel by many other producers, but one that Macallan’s frankly ridiculous stocks of sherried whisky allowed. We can only speculate, but the one thing those stocks didn’t necessarily contain was enough whisky of certain ages to meet the current worldwide demand, leading them to do away with the age statements and focus on producing whisky of consistent quality and flavour. 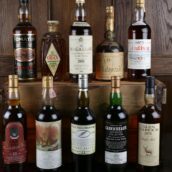 The future does look bright though, as Macallan estimate that they are currently purchasing over 80% of the newly built sherry casks coming out Spain, a yearly investment of about £16m – if the wheel of whisky fads swings back around to age statements in the future, Macallan should be ready to oblige. 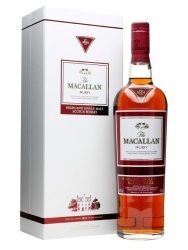 Of course, the move to NAS sparked outrage among the whisky geeks and Macallan fans, as well as many regular consumers who have been buying the various Macallan expressions for years. With more companies looking to NAS whiskies over recent times there has been endless debate about the merits of age as a yardstick (with Tim’s predictions from 2010 now looking even more prescient), as opposed to trusting the producers to make good whisky, with good points on both sides. However, with Macallan entering the ring things got a bit more serious. A year down the line things have calmed down a bit. 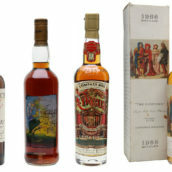 There are still (near constant) debates and rants about the world of NAS whisky, and discussions over the comparisons between the 1824 Series and the whiskies they have replaced continue, but generally things seem to be returning to how they were before – people are trying, selecting and buying whisky, and many of them are Macallans. Despite us running barrel-top tastings in our shop for the new range, other than a quick taste of some samples around the time of their release I’ve not had a chance to work my way through the complete 1824 Series. The Gold was released a while before the other three entries in the range and it popped up at a number of tastings I attended and helped run, but the Amber, Sienna and Ruby have been a little more elusive. Fortunately, the launch of the Macallan M, the pinnacle of the 1824 Series, included a tasting of the range giving me a chance to do a bit of a compare and contrast. At the start of the range is Gold, which is, as the name suggests, a firmly golden dram. It’s a vatting of whisky matured in a combination of both first and refill sherry casks, themselves a mixture of American and Spanish oak. 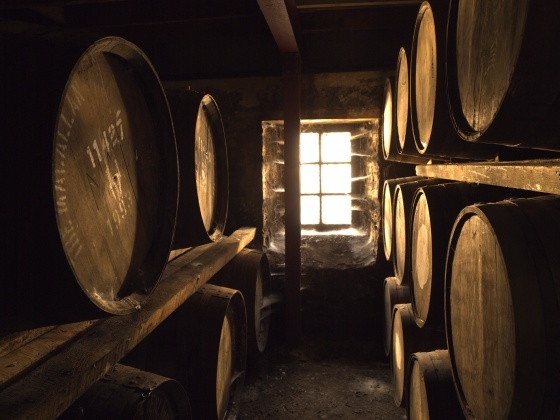 While it’s a common misconception that sherry casks are all European oak, that’s definitely not the case, with many bodegas using American oak for reasons of both cost and flavour – the tighter grain of the American oak works well for both holding sherry while it matures and as a whisky cask being seasoned with sherry. Nose: Buttery and creamy, with grapefruit tinged citrus notes providing background sharpness. On top of that comes layers of more traditional sherry notes, with milk chocolate, sugared raisins and spiced apple. Palate: It’s definitely a sherry cask matured dram, with milk chocolate, cocoa and stewed apple providing some richer flavours, with toffee and cinnamon adding some spice and sweetness, and a hint of lemon zest giving freshness. Finish: Medium length, with lingering raisins, cocoa and a touch of woody spice. Comment: A zesty dram, with some sweeter and lighter notes balancing a bed of gentle sherry influence. Nose: A combination of citrus and sherry – lemon peel and raisins, scotch pancakes, cinnamon butter, sherbert lemons, lemon drizzle cake, brown sugar and lightly spiced fruitcake. Palate: Oily and thck, with butter and cinnamon and sugar quickly turning to lemon heavy fruit cake, with a base of sweet raisins. Light and fresh with a rich and earthy background. Finish: Cinnamon, lemon boiled sweets, freshly cut wood and touches of black pepper. Comment: Quite similar in style to the gold, but with more citrus and less chocolate. Nose: Rich and oily, with candied orange peel, orange jelly, dried mixed fruit, demerara sugar syrup, crystallised ginger, cinnamon butter (Norwegian Cinnamon bun dough? ), hints of green leaves and a light floral touch. Palate: In general quite sweet, but with dry cinnamon and sharp wood to start. Warming spice is joined by fragrant orange peel and blood oranges, dark liquorice, touches of barrel char and freshly cut staves. It moves towards some tannic notes, with apple skins and more wood developing, but is balanced by a bit of sweet and creamy fruit cake batter (uncooked). Finish: Lingering spiced butter, stewed and baked apples (with cinnamon and raisins), lightly bitter wood and lightly toasted white bread. Comment: A move from the lemony focus of the earlier two expressions to a solid orange citrus centre. Around that the amount of traditional sherried flavours has been stepped to give a nice bite and balance. The top of the regular range, sitting beside the massively popular but increasingly hard to find 18 year old, is Ruby. It’s vatted from only first fill casks, giving it’s titular deep red hue. Nose: Glacé cherries, eccles cakes (good ones from a proper bakery), maple syrup, pecan pie, orange zest and jelly, hints of clove, lots of mixed peel, waxed oak, vanilla (with hints of custard) and spiced cake batter. 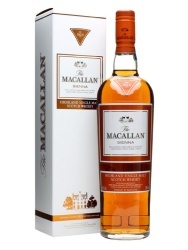 Palate: Big dried fruit and spice, the sort of thing you look for in this sort of Macallan – raisins, dark brown sugar, oaky tannins, old dry leather, damp bark and barrel char. Pontefract cakes and liquorice root, along with dark Christmas cake, dates and plums, add a balancing sweetness. Finish: Tannic wood, dark woody spice, shriveled raisins, old barrel staves and candied orange peel. 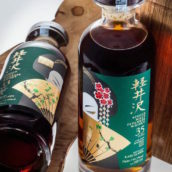 Comment: A big, sherried whisky with the dark savoury flavours that I look for as well as some rich sweetness to stop things getting a bit too heavy. I missed some of the ‘forest floor’ flavours you often find in sherried whiskies of this kind of weight, but this was clean, spicy and the obvious next step in the progression. After we’d worked our way through the series Sukhinder asked me a question that I need to ask myself more often after vertical tastings – “After going from Gold to Ruby can you go back down the range and still enjoy each whisky?” The answer is yes – each dram has its place on the flavour spectrum as well as on a price list. They’re definitely cut from the same cloth, but with citrus flavours varying from lemon to orange and levels of sherry influence changing between each bottle we get four quite distinct whiskies, each with their own place in the world. Speaking to various other people who’ve tasted their way through the range it seems that everyone has a different favourite, with the fans of big sherry going for the Ruby and the Amber and Sienna dividing opinion over which is the best value for money. The Gold gets a bit of a short shrift thanks to its ‘entry-level’ position, but having seen it perform excellently at blind tastings, without the subconscious bias that has been introduced into the minds of many a whisky fan, it certainly fits in the range. 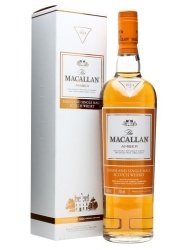 The final whisky in the 1824 Series is one that sits very much outside of the realm of every-day dram for most of us – the Macallan M. An ongoing yearly limited release, with 1750 bottles of this year’s available, it first appeared in Hong Kong travel retail in May 2013. 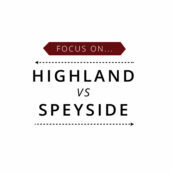 This lead to some confusion over a recent ‘launch’ press release received by many bloggers and writers – it has now been released to the general market, which in the case of a high-end dram like the M is a fairly intimate group of specialist retailers. A group that, of course, includes us. 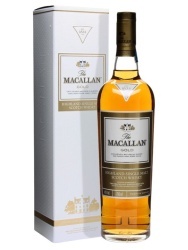 The whisky’s focus is the thick and syrupy style of old sherry cask Macallan and though each release will vary based on cask availability, the intention is to very much keep it in that classic style. While the M has no age statement they did let slip that the oldest component in this first release was ‘distilled while the Battle of Britain raged’ – 1940. As with many high-end releases, there is a chunk of emphasis on the decanter – bottle isn’t quite fancy enough a word. We suspect it will be quite divisive, with a hard edged modern design not being to everyone’s taste. It’s designed by Fabien Baron, well known for his work in fashion, cosmetics and other high-end luxury goods areas, and the intention is to be a bit different, continuing the evolution of design shown in their other high-end decanters. So, the fine print – the 2013 edition is bottled at 44.7% and has a predicted retail price of about £3000. Nose: Old and elegant, with brown sugar, spiced custard, marzipan, butter icing and sultanas – excellent wedding cake. There are also some forest hints, with autumn leaves, mint, ferns and gentle damp oak, as well as crushed digestive biscuits, dried orange peel and some dry woody spice. Palate: Dry and spicy, with rich dried orange peel, fragrant sandalwood, spiced butter, riverbank earth, damson jam and tingly spice – a grown up fruitcake, with rich savoury notes as well as sweet fruit. With that comes green wood, liquorice root and hard black liquorice sticks. Finish: Long but pleasantly soft, with menthol touches, well-worn dark wooden floorboards, cinnamon and clove, plump raisins and a touch of rich, savoury earthiness. Comment: A core of very old-school Macallan, with lots of savoury earth, wood and dark fruit, rounded out by some sweeter, richer fruity flavours. The 1824 Series motif continues, with the developing citrus of the rest of the range becoming fragrant dried orange. A fitting culmination to the line-up. An impressive dram and happy evidence that Macallan do still have some impressive old whiskies hiding in their warehouses. With their investment in sherry casks and their return to their roots we can but hope that they’ll keep on with their refocus on sherry matured drams and keep making good whisky for a long while yet. If you want to learn more about the Macallan 1824 Series we’ve got a rather shiny looking micro-site over on the main Whisky Exchange site.